It’s been an odd couple of weeks. Rob is a university lecturer – electronic engineering and microwave engineering – I don’t understand what he does – and he was told by his union last month that changes were being proposed which would impact on his pension. This could mean he would receive around 20-30% less than he was expecting. So his union has called for the lecturers to go on strike. Rob has had a great deal of support from his union who were a real help when his work suffered due to his depression. So because of this, and the concern about his pension he has agreed to follow his colleagues and go on strike. We had to talk this through as he would lose half a month’s pay. This isn’t ideal as we are hoping to install a new kitchen – more on that later – but needs must. I’m not going to get into the politics of it all here – striking, pensions and the like – but I supported his decision, mostly for selfish reasons. If I’m honest, entirely selfish reasons. Rob and I have been together for fifteen years now – seventeen if you count the before marriage bit. We love each other dearly, well, I know I love him and I’m pretty sure he loves me. So we are hoping to retire together to our place in the middle of nowhere. That’s the dream. This is absolute crap. When I think about the reality of Rob and I living together without the children I picture the following: The house being a complete tip because both of us think the other should be doing the tidying; Me being driven mad by Rob loitering about wanting to talk to me when I am trying to read; Sitting in silence for hours because without the children to discuss we will become those couples who don’t talk to each other; Rob thinking I have to entertain him because he’s bored but I am still reading. So in order to save our marriage into retirement, (all being well and that we are healthy) it is going to be very important we have as good a pension as possible as we will only survive if we can afford a cleaner to come in and muck out the filth occasionally. I will also need to be taken to nice hotels (3* minimum) so I can read in nice rooms which have mini bars. Holiday and travelling will also be good as it will give us something to talk about. So Rob is losing two weeks’ pay, but short term pain for long term benefit I hope. Let’s also hope that they come to the negotiating table soon so it won’t last for too long. The other selfish reason I am pleased he is striking is because the children have been stuck at home for three days because of the snow. As Rob is at home it means I can continue my walk to work to make sure all those pupils know how to write essays on great literature. Snow! Yay! I love snow! Not so keen on the children being at home all day, though. It all started really well. Being a well-organised *cough* mother, I actually managed to find the waterproof snow gloves from last year and sent off the little poppets into the garden to play with the carpet of snow which had fallen over night. Son slouched about a bit and threw snowballs at Dog for half an hour or so before charging back in declaring, ‘it’s freezing!’ and settling back down in front of the PlayStation to play Fortnite. He is obsessed with this game. Have you heard of it? He plays it with a headphone and mike set on so he looks like he should be working in telesales. Daughter LOVED every minute. With grim determination she spent hours rolling two snowballs around and around until they were big enough to make a stupendous snowman, which she put on top of the picnic table. Daughter was delighted with herself and did an entire photo shoot – this is one of about 37 pictures she took with my phone. I was slightly miffed as that is a very expensive cashmere scarf around the snowman’s neck. Daughter raided my ‘special scarves’ drawer, but I didn’t have the heart to take it off. I replaced it with one of Rob’s cheap ones after she had gone to bed. That night there was great excitement in the House as a fox was spotted prowling around the garden. We live in the city so this was very unusual. The next morning I threw open the curtains to see even more snow had fallen. I peered out to see how Daughter’s snowman was doing and was puzzled when I couldn’t see it. In a thick dressing gown and dog-savaged-wellies I snuck out into the garden to give Dog a comfort break and check on the snowman. Horrors! Only a sad little pile of snow remained with the scarf lying on the floor. What had happened!? Who would have done this? Daughter will be heart-broken. As I was climbing the stairs thinking how was I going to tell Daughter about the destroyed snowman two jigsaw pieces fell together in my head. 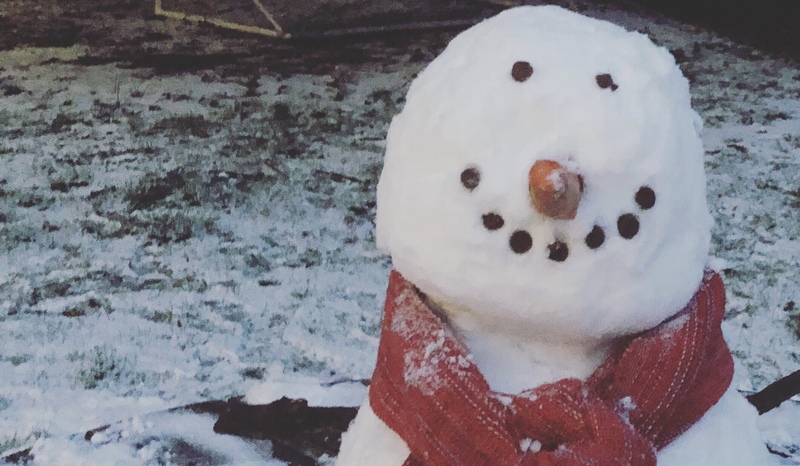 When making the snowman Daughter couldn’t work out what to use for the eyes and month. She couldn’t find any stones so decided to use dog biscuits, which worked wonderfully. Unfortunately, it meant our fox visitor of the night before discovered this snack and basically ate the face off Daughter’s Snowman. Lesson learned: Don’t use dog biscuits to decorate a snowman. After day two Son was still happily playing Fortnite with his mates who were also off school. Daughter, who thankfully isn’t really into devices and gadgets quite so much, is bored of the snow and is moping around driving Rob mad. He keeps texting me while I am teaching asking when will I be back, and what’s for lunch, and that the kids were driving him mad. I suggested he told daughter to do some baking. They duly found a cake recipe and sent a request I bring back flour and butter. Returning from school with the carrier bags bulging, covered in snow and feeling like Scott of the Antarctic, I gave daughter the ingredients. All was going well. All was quiet and harmonious. Rob suggested a cheeky glass of wine to which I quickly agreed. Son on PlayStation, Daughter humming merrily in the kitchen. In this photo she is mixing a giant batch of butter icing for her cake. Just look at how much is in that large bowl. Butter and sugar. While Rob and I chat in the sitting room, Daughter goes to our bedroom to look for the recipe she had left there. Fatally leaving the bowl unguarded. Yup. Dog ate the ENTIRE bowl in 4 seconds flat. Here is a picture to remind you of what Dog looked like the last time her greed and stupidity got her into trouble. The next four hours were spent sending the Dog out to the garden where she ate grass and was sick. We hoped we’d got it all, but the next morning, following the sound of retching coming from Rob’s office, I found Rob dry heaving over a round puddle of dried sick that Dog had left on the window seat. Not only had she upchucked on the window seat, it had managed to drip through the hinges onto the board games stored below. Rob (apparently) is incapable of clearing up dog sick or poo as it makes him retch. He plays this ‘get out of jail free’ card fairly often as Dog is very greedy, a bit stupid, and regularly overeats things that don’t agree with her, including balloons. It is no point pushing him as he will then just say, ‘I told you I never wanted to get a bloody dog, we agreed I’d have nothing to do with anything like this…’ (gestures to whatever body fluid the dog has ejected), finishing with, ‘you reap what you sow’ and a dark look before returning to his coffee and paper. Dog is now fine, but Rob is still looking a bit green around the gills and I have to buy more hygiene gloves as I have now got through a whole pack of them. Finally we come to the kitchen. Thanks to selling Rob’s tiny bachelor pad flat (it took four years before someone finally plucked up the courage to take it off our hands) Rob has now got a bit of cash, which means we can put in a new kitchen to replace the five hundred years old (feels like) kitchen currently mouldering away in the house we bought last year. As you know, Rob is a lecturer. His number one skill is researching thousands of options and weighing up the pros and cons of what is the best solution. This is all very well if you’re working on bandwidths that can work on a high level to make wifi more effective, or something, but not great when you are trying to reach a mutually acceptable design for a new kitchen. Modern? Traditional? Rustic Modern? City Modern? Shaker? Light floor? Dark Floor? Wood floor? Stone floor? My contribution is I really, really want one of those beautiful big, double door American fridges. The ones which have an ice dispenser and bags of room – freezer down one side. I’ve never had a nice fridge – they’ve always been crappy, second hand (usually inherited from dead neighbours of our parents), low down ones which have strange stains on them. Those ones where you have to get down on your hands and knees to find the butter. I cannot handle this amount of choice. I keep telling him, do all the research and then when he has narrowed it down to three options, I’ll pick one. But he’s still beavering away trying different ideas that never seem to end. It’s called the High and Mighty Chilli Penguin Stove in charred red from This Company, and we love, love, love it. See the little bit at the top? You can cook scones and pizzas in it! It also comes in a nice petrol blue. So Rob and I have decided to base the entire design around this stove. After hours of debate we have cautiously agreed upon, possibly, a glossy white kitchen with wooden work tops and dark oak floor boards. I have looked at so many Pintrest posts my eyes feel like they are bleeding. How do people make the choices? I went into a kitchen shop to look at a beautiful kitchen that seemed perfect. It was lovely. The owner of the shop chatted to me for ages before telling me that particular kitchen would come to around 35 grand. I didn’t tell him our budget for the kitchen is about £2,500 at the very most (and that has to include the fridge. I’m not doing without the damn fridge). Any advice from you, dear readers, on what kind of kitchen would go with that stove would be gratefully received. Also, how do you reach a decision with your partner – flip a coin? Hope you’re all keeping safe and warm! We went through a strike. Thousands of dollars of income lost in the 6 weeks he was marching at his college campus. And the end result wasn’t really anything earth shattering. The politicians here are useless.. 😛 Good luck to you. And yes, I hear you on the ‘what’s gonna happen in retirement’…we are all so much like that too, same boat kind of thing. Thank you! I’m glad you enjoyed it – we need to all stick together, it sure helps to laugh about it! Those Labs are so greedy – a bag of icing sugar though! Bleuflrgh! Thanks for reading!